Colon Hydrotherapy Three Sessions use low pressure UV filtered water to flush out accumulated, impacted and hard waste from the Colon. These 30-45 minute, painless processes use a disposable speculum to stimulate the muscles of colon. Colonic Hydrotherapy Three Sessions are a process that uses low pressure UV filtered water to flush out accumulated, impacted and hard waste from the Large Intestine or Colon. This 30-45 minute, painless process uses a disposable speculum to allow 10 – 20 gallons of u-v filtered water to stimulate the muscles of the colon. Expect to: Experience increased energy, improved peristalsis action, relief from aches and pains, the elimination of bloating and gas and the ability to absorb nutrients better. Waste loss varies between 2 and 7 lbs. depending on size and condition. 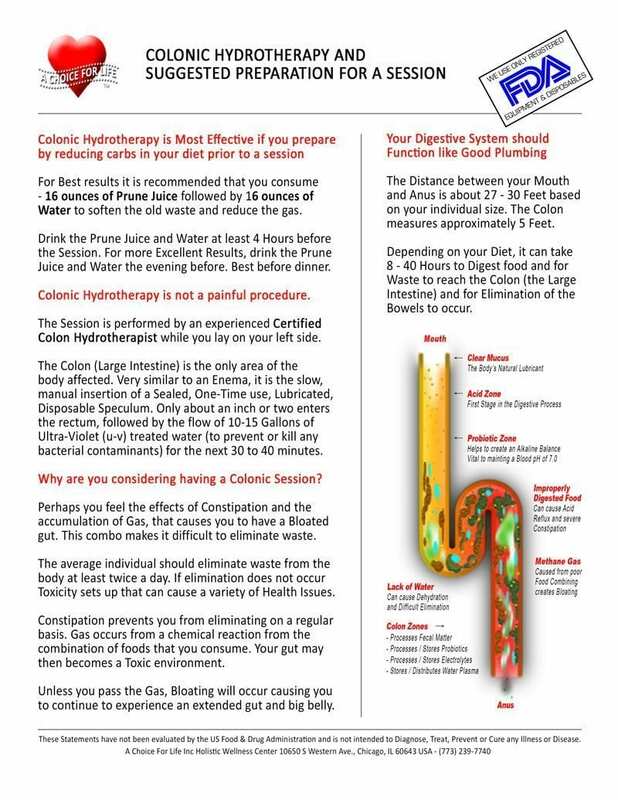 Colon Hydrotherapy is not a painful process. Simple Preparation is suggested the day or evening prior to the session to soften waste and reduce gas. Colonoscopy is not be confused with Colonic Hydrotherapy Three Sessions but is often done before and after a Colonoscopy. Gastroenterologists often suggest Colonic Hydrotherapy Three Sessions help remove stubborn waste from the colon prior to the test. Colonic Hydrotherapy Three Sessions can be repeated three or more times in a year.